What are the qualities of a great leader? What I look for most is Moral Character...which means the willingness to stand up for what you believe in, even in the face of adversity. 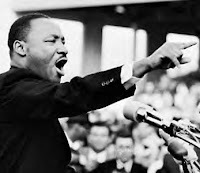 The link below takes you to a brief video of MLK speaking on his morals in reference to his stand on the Vietnam War, in which he received criticism from many.....How can we encourage moral leadership today? Segregation of Moral concerns-- where did we loose what MLK spoke about. We have such Moral fluidity now-- where are the leaders with Moral consistency? 360 degree feedback is a tool for HR Department to get the knowledge of the competitive advantage and disadvantages of the current manpower resources and how to make them effective for the organisation, what is 360 degree feedback. He sure was a great man, his ideas and visions were so good, it is a shame that happened what happen.